Significant and unique artifacts from the O’Malley family collection will be on display during the Brooklyn Historical Society’s special exhibit, “Until Everyone Has it Made: Jackie Robinson’s Legacy,” April 5, 2017-June 2018. The exhibit coincides with the 70th Anniversary of Robinson becoming the first African American to play Major League Baseball for the Brooklyn Dodgers on April 15, 1947. The Brooklyn Historical Society will prominently display from its permanent collection the 17-foot long 1955 Dodger World Championship banner, which was presented as a gift to the Society from Peter O’Malley in 1995. 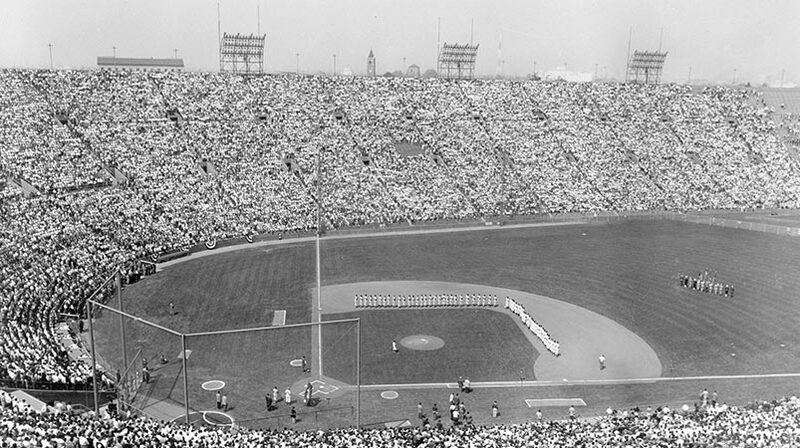 The white banner, which was first raised on Opening Day 1956 at Ebbets Field, with blue lettering reads, “World Champions 1955 Dodgers”. O’Malley said when he donated the banner, “It belongs in Brooklyn.” Robinson played on that World Series winner, the first and only one in Brooklyn. Among the artifacts from O’Malley to be displayed for the first time is a 1947 Brooklyn Dodger team baseball with bold signatures, including Robinson’s autograph on the “sweet spot”; and an original 1946 Montreal Royals program from Daytona Beach, FL when Robinson was wearing uniform number 9, not his familiar and now MLB retired uniform number 42. Also, an original program from 1947 Dodger Spring Training in Havana, Cuba at Gran Stadium, where Robinson trained with the Royals in anticipation of his call-up to the major league roster for Opening Day on April 15, will be shown. Robinson wore uniform number 9 during Spring Training in Cuba, which was to be a “safe haven” for him, though he was precluded from staying at the same hotel as his white teammates. Other items on loan are a 1947 National League Championship Louisville Slugger black bat; Quick, News weekly magazine from October 6, 1952, with Robinson on the color cover at Ebbets Field; and an original black and white postcard with a photograph of Robinson and teammate Pee Wee Reese making a double play. On the front of the postcard is a note from Robinson, “We’ll nail them both in ’52; the pennant and the World Series” with his printed signature. A newspaper clipping from the New York Sun, October 30, 1950 will be displayed in which Dodger President Walter O’Malley states, “prejudices have no place in society – and certainly not in sports.” Walter O’Malley and Dodger President Branch Rickey were equal ownership partners and O’Malley approved the decision by Rickey to make the historic signing of Robinson. Also, several O’Malley family black and white photos of Robinson will be displayed. Peter O’Malley, President of the Los Angeles Dodgers from 1970-1998, explained why the history of Jackie Robinson and this exhibit are so relevant. In his first season with the Dodgers, Robinson helped lead the team to the National League Pennant with a 94-60 record and he also earned Rookie of the Year honors, the award now named for him. Louisville Slugger created the black bats to commemorate the N.L. Championship and were awarded to players, coaches and executives, a tradition started in 1934. Robinson, known for his electrifying style of play on the basepaths, played 10 seasons with the Dodgers, stole home plate 19 times in his career and played on the 1955 Dodger World Championship team, as well as six Dodger pennant-winning teams. In 1949, he won the N.L. batting title (.342) and was named N.L. MVP. The six-time N.L. All-Star was inducted into the National Baseball Hall of Fame in 1962. Artifacts from the O’Malley family collection, which have been on display at 13 major museums and exhibitions since 2002 (see below), were on display at the Brooklyn Historical Society from 2010-2012. However, none of the current exhibit items have been presented before. Exhibit includes: 1) Three original brochures and sticker from 1958 “Proposition B” voting in Los Angeles to determine if the City contract previously signed with the Dodgers would stay in effect. A “Yes” vote on Prop B meant the contract would remain, while a “No” vote meant that it would be defeated. 2) Original Dodger Yearbooks from 1958 and 1960. The 1958 Dodger Yearbook, their inaugural season in L.A. featured facsimile autographs of the players, Manager Walter Alston and coaches. The 1960 Dodger Yearbook featured a rendering of the new Dodger Stadium to be privately built by Walter O’Malley. 3) A selection of 11 photographs from the Dodgers’ arrival in Los Angeles reproduced and with captions. 4) Three replicas of newspaper color special sections welcoming the Dodgers to L.A. in April, 1958. Two photographs from the Dodgers’ 1956 Goodwill Tour to Japan will be featured in the United States Embassy’s baseball exhibit, “Pacific Pitch: U.S.-Japan Baseball Diplomacy”, which opened on June 1, 2017 at the Tokyo Metropolitan Central Library. The touring exhibit will travel to Okinawa, Osaka and the Tsunami raved region until 2018. The exhibit, which was curated by the Meridian International Center in Washington, D.C., shows in photographs the longstanding relationship between the two countries dating back to the 1870’s when American teachers and professors introduced baseball to Japan. In 1896, the first international game was played in Japan between Ichiko (the first High School) and the American residents of Yokohama. One photo is of Dodger star Jackie Robinson sliding into third base during an exhibition game, while the other shows Dodger players wearing Happi coats and hachimaki during a reception with Dodger President Walter O’Malley and National League President Warren Giles and their hosts from Japan. Both photos were made available by Historic Dodgertown – Vero Beach, Florida Chairman Peter O’Malley. The Dodgers made two Goodwill Tours to Japan sponsored by Yomiuri – in the fall of 1956 and, again, in 1966. Matsutaro Shoriki, the “Father of Baseball in Japan” and the founder of the Yomiuri Shimbun dispatched Sotaro Suzuki to New York to meet with O’Malley in 1956. Sportswriter Suzuki, who later was inducted into the Japan Baseball Hall of Fame, invited O’Malley to send his Brooklyn Dodgers to Japan for a 20-game tour in October and November. After many discussions with baseball officials and Dodger personnel, O’Malley agreed to make the significant trip, not far removed from the end of World War II. The National League Champion Dodgers went 14-4-1 on the exhibition tour, playing to large and enthusiastic crowds from Tokyo to Osaka. One of the most memorable and poignant moments of the tour was the Dodgers visit to Hiroshima on November 1, when they presented a bronze plaque which was placed at the entrance of the stadium which was inscribed, “We dedicate this visit in memory of those baseball fans and others who here died by atomic action on Aug. 6, 1945. May their souls rest in peace and with God’s help and man’s resolution peace will prevail forever, amen.” The plaque included the names of O’Malley, Dodger Manager Walter Alston, Dodger shortstop and team captain Pee Wee Reese and other club executives. This successful visit to Japan strengthened the bond of friendship between the Dodgers and Japan and spawned more international interaction, including the very next spring at Dodgertown, Vero Beach, Florida. Tokyo Yomiuri Giants Manager Shigeru Mizuhara (later inducted into the Japan Baseball Hall of Fame) and players Shigeru Fujio (catcher) and Sho Horiuchi (pitcher) were invited by O’Malley to visit the Spring Training home of the Dodgers and observe training techniques. Suzuki joined them during their visit. During 1957 Spring Training, an identical sister plaque from the one in Hiroshima was installed at the west side of the press box at Holman Stadium, the Dodgertown home ballpark of the Dodgers from 1953-2008 and has remained there ever since. Historic Dodgertown – Vero Beach was the spring training site of the Tokyo Yomiuri Giants in 1961, 1967, 1971, 1975 and 1981 and the Chunichi Dragons of Nagoya in 1988. In 1993, Peter O’Malley arranged for the Dodger Friendship Series tour to Fukuoka, Japan. • The shovel used by Dodger President Walter O’Malley during groundbreaking ceremonies for Dodger Stadium on September 17, 1959 with engraved plate was donated in 2008 to the National Baseball Hall of Fame by the O’Malley Family. • The original 1955 Brooklyn Dodgers World Championship banner, which flew over Ebbets Field in 1956, was donated by Dodger President Peter O’Malley to the Brooklyn Historical Society in 1995.